This year, being my last election, I announced my candidacy. As my last election, this marks my 9th so far. I’ve taken part in every election since the first one. Thankfully I’ve gone from 4th, 5th, 2nd, 3rd, 1st, 3rd, and 2nd. Thanks to all of your support, I’ve always been in the Kami 7 and always been in the top 5. I’ll never be able to properly thank you. Since this is my last election, in 2014 you placed me in #1, and I tried my best thinking I wanted to be #1 again. I couldn’t do it and am #2. But thanks to all the fans, up until this time, though handshake events, Twitter, I’ve received so many words of encouragement. It was a very happy time. If I said I had no regrets, I’d be lying. Of course, I’ve been had frustrating memories. But having received this #2 position, I’m truly very happy. So this is what it’s become. To everyone watching at home or at the public viewing, and to everyone who is here now. There’s something I need to say. 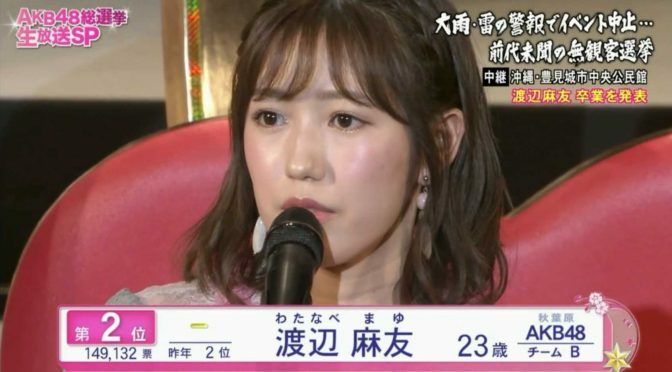 I, Watanabe Mayu, will graduate from AKB48. Yes… I’ve decided to graduate. When I was 14 years old, I entered the AKB48 group that I loved. And this year, in April, it’s been 10 years now. I’m 23 years old, and I’ve had lots of experience as an early AKB48 member. I’ve learned a great many things. 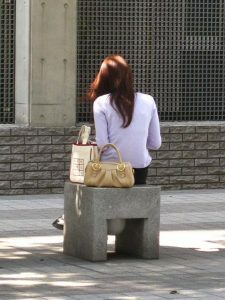 Now I’m going to the outside world, and I’ll be starting anew. I’m determined to make a fresh start in the outside world. 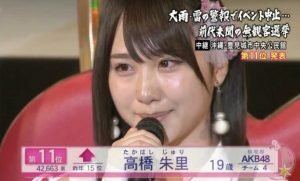 When I was listening to everyone’s speeches, listened to their promising words, and I thought that I wanted to entrust AKB48 to them. And, as always, I’m filled with gratitude to all the supportive fans. And I feel the same way this year. There isn’t much time left, but with the time that we have together, I want to continue forward with AKB’s mission. Yes! For today’s #2 position, and for all the support you’ve given me, thank you very much! I wasn’t sure what to do these past 2-3 years, but while I was worried about it recently, a decision came to me. In the end, I got some advice… but in the end, I decided on my own. I think I’ve surprised you all, but I really feel that there’s nothing left I can leave behind as an AKB48 member. So I hope we’ll have fun with the time I’ve got left. Thank you! I was watching the event but I have little acknowledge on Japanese but I felt like I knew what she said. I just couldn’t believe it. 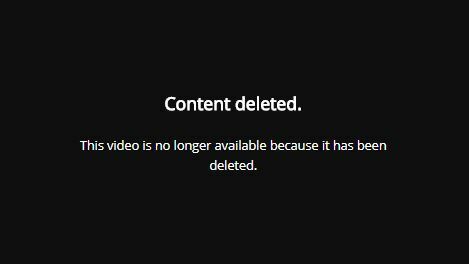 After watching the video, I’m very sad about the announcement. She’s been my all-time favorite idol. Ever since I discovered her from the Saba Doru drama. I didn’t even know she was an actual idol at the time, much less knowing AKB48. But she’s the reason why she got me into it and decided that I want to support her. I don’t know what else to say anymore. I don’t know who I can support next or just give up getting into AKB48 altogether.